"promote interest in old mills and other Americana now quickly passing from the present scene. It reports to its members through a quarterly magazine, "Old Mill News" or OMN. This society will help in any way it can in the preservation or rebuilding of such structures. It also will honor those individuals whose works and ideas made these mill possible. It will report to the membership, and to the public, through a periodical with pictures and comments. It will keep files and maintain a library on mills and related subects and will try to keep abreast of changes and happending. It will act as a clearing house on this mill information among all those interested. It will sponsor meetings and correspondence among its members and friends." The Society, also known as SPOOM, was chartered in Maine as a non-profit organization in 1972. 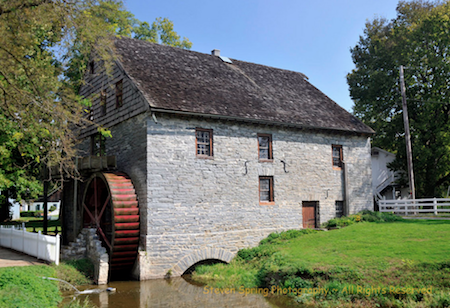 Its members include mill owners, old mill buffs, museum curators, conservators, writers, teachers, artists, photographers, equipment supply firms, and institutions such as libraries. Membership is open to any individual who shares the interests and purposes of SPOOM. The Society shares common interests with the International Molinological Society (TIMS) which is a world-wide organization of around 500 members from more than 35 countries and five continents.